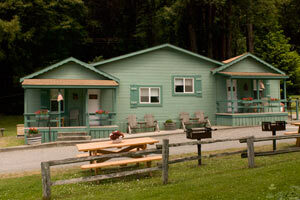 We offer five 1 bedroom cabins, two 2 bedroom cabins, and one vacation home which all feature a living room with a flat screen TV and DVD player, kitchen, bathroom with shower, and linens. 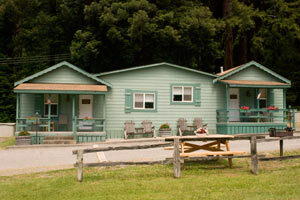 The fully equipped kitchens include stove, 2 door refrigerator, microwave, toaster, coffee maker, crock pot, dishes, pots, pans and all the utensils you'll need. 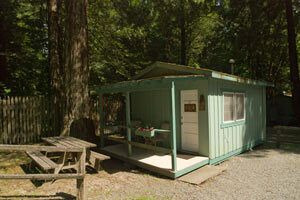 Each of our one and two bedroom cabins have a charcoal BBQ and a picnic table. 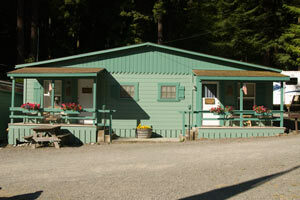 We also offer three 1 room cabins that have a bathroom with shower, linens, flat screen TV and DVD player, refrigerator, microwave, coffee maker and picnic table. 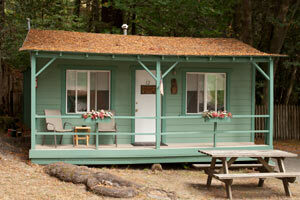 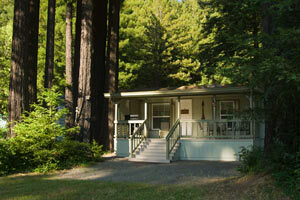 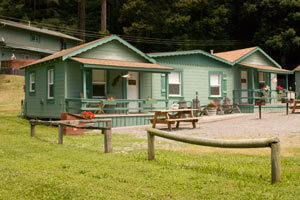 All of our housekeeping cabins have their own front porch and are surrounded by the majestic redwoods.